How old were the players who scored touchdowns in the NFL in 2013? Did you know that of the 1,393 touchdowns scored in the NFL in 2013 that 86 percent of those TDs were scored by players in their 20s? Last season there were 1,393 touchdowns, 1,198 scored by players in their 20s and 195 scored by players in their 30s. The youngest player to score a TD last season was Houston’s DeAndre Hopkins who was 21 years and 101 days when he caught an overtime TD pass from Matt Schaub. The oldest to score a TD in 2013? 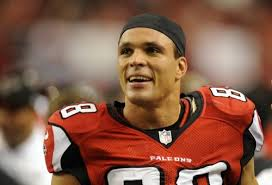 The recently-retired Tony Gonzalez who was 37 years and 299 days when he caught a TD pass for the Atlanta Falcons. A closer look at the age of players who scored TDs in the 2013 NFL season showed that over 60 percent were scored by players under the age of 27. This year the most TDs were scored by players age 26 (223). Last season most of the touchdowns were scored by players age 25 (203). Of all the players age 30 and older, Wes Welker had the most TDs with 11. The 2013 playoffs saw 46 TDs scored with nine by players 30 years old and older and 37 (80% scored by players in their 20’s. San Diego receiver Keenan Allen was the youngest player to score a TD in this year’s playoffs… he was 21 years and 260 days. New England QB Tom Brady was the oldest player to score a playoff TD this year at age 36 and 169 days.